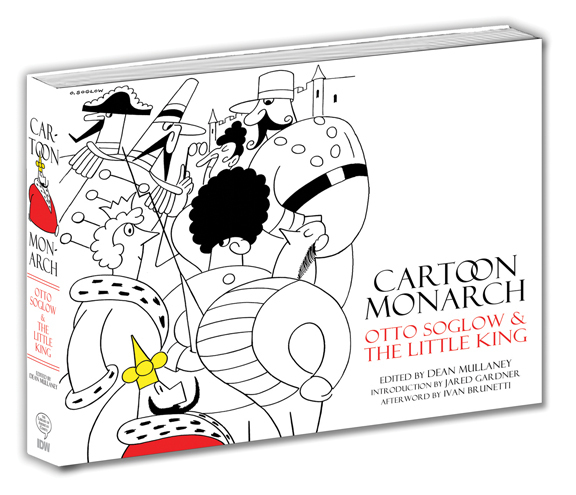 It's about time that Otto Soglow and his Little King finally got their due. Universally admired for his economy of line and elegant flowing style, Soglow's art is a treat that should have this book on any cartooning fan's wish list. We couldn't ask for more in this collection. There are more Little King strips in here than you can shake a stick at, so many in fact that we really get to know Soglow's tricks for putting together pantomime gags. Pantomime is the toughest act to pull off in comics, and to get inside Soglow's mind to this extent is an enlightening treat. What is also wonderful is that the strips are chosen from a complete cross-section of the strip's lifespan. Oddly enough, I found the latest material (1975) to be perhaps the most fascinating. By this time Soglow's aging mind seemed to be a little off, and the strips become downright Dali-esque. The surreal element was probably unintentional, but it is quite unsettling work, especially when tackled right after perusing the earlier more lighthearted strips. In addition to The Little King, we also get a good sampling of The Ambassador, Soglow's 1933-34 stand-in while King Features was waiting for the rights to use The Little King, originally held by The New Yorker. We also get some Sentinel Louie topper strips. An excellent biographical essay by Jared Gardner includes rare early Soglow work, including material in different styles that you would never guess to be Soglow's.The only thing I missed was a sampling of Soglow's short-lived Travelin' Gus strip, but that has been reprinted in Hogan's Alley magazine, so I guess they felt that strip had already gotten its due. 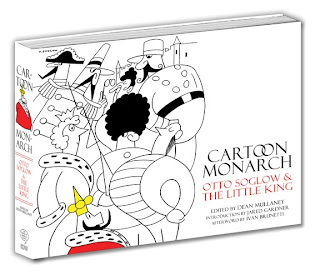 Most of the Little King strips are reproduced in black and white, but there is a color section of nearly a hundred pages. That gives you plenty of the flavor of the feature as it was seen in Sunday papers. Because of Soglow's incredible linework, the switch to black and white for the majority of the book is perfectly fine, as it allows us to bask in Soglow's work without chromatic distractions. It hardly needs to be mentioned of an IDW/Dean Mullaney production, but the restoration of the strips, and the quality of the presentation, is utterly superb. Thanks to IDW for another great collection! Do you see any point in a second book--or do you think this single volume is enough? Hmm. As much as I love Soglow, I think I'm sated for the time being. About the only thing that might get my motor running again is a longer form bio with lots of his early and secondary work.